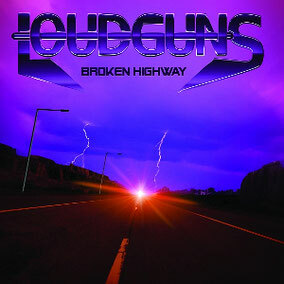 LOUDGUNS is a six piece Hard Rock band from Finland. On November 4th, they re-released their 2011 debut album “Broken Highway” through City Of Lights Records as strictly limited collector's item on 300 CDs only. “Broken Highway” offers first class Melodic Hard Rock and AOR influenced by the 80s style like HOUSTON, H.E.A.T., BROTHER FIRETRIBE, GRAND DESIGN, FIREHOUSE and early EUROPE. LOUDGUNS was formed by guitarist Sami Pilve in 2009 and released an EP “Before The Sunset” in 2013 and their second album “Sunset Runaway” in 2014, with the exception of the debut album. Their releases have gained a lot of attention by selling in over 40 countries and making it to the magazines and radios worldwide. Now the band has a new singer Olli Kärki (ex-RUINSIDE) and he will appear on their third album the band is currently working on.